Continuing its drive to enter the so-called "Tablet War", Sony is now joining the ranks of Samsung, RIM BlackBerry and Hewlett Packard in a league of Apple iPad competitors. Sony hopes to challenge the huge market lead Apple has with its popular tablet dubbed the 'iPad'. Currently on the market are approximately 100 other iPad challenges with mediocre to "OK" reviews but Sony has one thing the others don't: linking the tablets to their gaming platform as they did with the "Playstation Phone", the Sony Ericsson Xperia Play. Sony hopes to link their experience in gaming to their tablet offerings. Motorola, LG and HTC are also attempting to get a piece of the pie with their launchings of tablets running the Google Android platform, the same platform Sony is expected to release their tablet on. The new Sony tablets are, well, oddly shaped like their Playstation Phone and look much different to what most others have come up with which all look rather similar to the design of the iPad and iPhone. The black, glossy, rounded-corner devices all seem to mimic the market which Apple first popularized. Whether the tablet market is here to stay or just a passing fad is really still up in the air. The two devices have been dubbed the "S1" and the "S2", code-names Sony refers to the new devices as of now. The S1 is a 9.4-inch (24cm) wide screen format which resembles a wedge-shaped door stopper while the S2 which looks a little bit like a Nintendo DS with a clam shell design measuring 2 5.5-inch screens (14cm). Both devices will be capable of running PlayStation games with access to the PS Store, will run Android "Honeycomb" 3.0 and will all come with Wi-Fi and/or 3G/3.5G/4G connectivity. They are also purportedly to support Infrared connectivity with Bravia displays, Sony's flat screen television line. The prices of the devices have not yet been released but might be available inline with Apple iPads. Android 3.0, says Sony, has been optimized for gadgets with larger screens with a "Holographic User Interface". Little is know yet about what a holographic UI is, but it sounds exciting. The weird and original shape of the new devices combined with their access to gaming content might actually give Sony the upper hand compared to their tablet rivals and could give the Android-powered tablet market a chance at playing catch up to Apple. 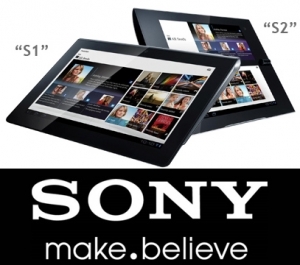 The Sony Tablets are expected to debut in Fall 2011.